Baird Advisors applies its time-tested, disciplined investment process in managing client portfolios to fixed income benchmarks across the duration spectrum. The investment objective of the Ultra Short Bond Strategy is to seek current income consistent with the preservation of capital. The strategy invests primarily in investment grade debt obligations, but may invest up to 10% of its net assets in non-investment grade obligations. Non-investment grade obligations, at the tme of purchase, are generally rated at lead B or higher by at least one major rating agency or, if unrated, determined by Baird Advisors to be comparable in quality to the rated obligations. The investment objective of the Short-Term Bond Strategy is to seek an annual rate of total return greater than the annual rate of total return of the Barclays 1-3 Year U.S. Government/Credit Bond Index. The strategy only invests in debt obligations rates investment grade at the time of purchase by at lease one major rating agency or, if unrated, determined by Baird Advisors to be investment grade. 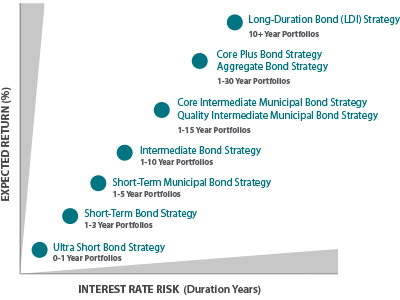 The investment objective of the Short-Term Municipal Bond Strategy is to seek a high level of current income that is exempt from federal income tax and is consistent with preservation of capital. The strategy invests in a broadly diversified portfolio of federally tax-exempt municipal obligations issued by governmental authorities throughout the U.S. and its territories. The Fund may invest in all types of municipal obligations, including pre-refunded bonds, general obigation bonds, revenue bonds, and municipal lease participations. The investment objective of the Intermediate Bond Strategy is to seek an annual rate of return greater than the annual rate of total return of the Barclays Intermediate U.S. Government/Credit Bond Index. The strategy only invests in debt obligations rated investment grade at the time of purchase by at least one major rating agency or, if unrated, determined by Baird Advisors to be investment grade. The primary investment objective of the Quality Intermediate Municipal Bond Strategy is to seek current income that is substantially exempt from federal income tax. A secondary objective is to seek total return with relatively low volatility of prinicpal. The strategy invests principally in investment grade, intermediate-term municipal obligations issued by state and local authorities. The strategy normally invests at least 80% of its net assets in a diversified portfolio of bonds and debentures, the interest on which is exempt from regular federal income and alternative minimum taxes. To achieve its quality and preservation of capital objectives, the strategy primarily invests in pre-refunded bonds, general obligations and essential service revenue issues. The investment objective of the Core Intermediate Municipal Bond Strategy is to seek a high level of current income that is exempt from federal income tax and is consistent with preservation of capital. The strategy invests in a broadly diversified portfolio of federally tax-exempt municipal obligations issued by governmental authorities throughout the U.S. and its territories. The strategy may invest in all types of municipal obligations, including pre-refunded bonds, general obligation bonds, revenue bonds and municipal lease participations. The investment objective of the Core Plus Bond Strategy is to seek an annual rate of total return greater than the annual rate of total return of the Barclays U.S. Universal Bond Index. The investment strategy invests primarily in investment grade debt obligations, but may invest up to 20% of its net assets in non-investment grade obligations. Non-investment grade obligations, at the time of purchase, are generally rated at least B or higher by at least one major rating agency or, if unrated, determined by Baird Advisors to be comparable in quality to the rated obligations. The investment objective of the Liability-Driven Investing Portfolio Strategy is to seek an annual rate of total return, before expenses, greater than the annual rate of total return of a benchmark selected for the client's portfolio. The particular benchmark is selected based on the specific client portfolio's investment objectives and may be either a published benchmark or a custom benchmark.